After several years attending community college part time (for reasons), I attended a Free Methodist university. The upsides were: the student-to-teacher ratios in all my classes were small, the campus was beautiful, and I got to know some wonderful people. The downsides are best summed up by pointing out that then Vice President George H.W. Bush was considered a dangerous liberal by much of the student body, while President Reagan was practically the second coming. Don’t believe me? I was one of only three people on the entire student newspaper staff who was not a Republican. Usually people expect the student newspaper to be one of the centers of radical left-wing ideology on a campus, right? Over the course of the next several classes, he said, it became clear the teacher had no idea what news reporting was. And he eventually got the teacher to admit that he had a degree in Business Administration with a minor in Pastoral Studies, and had never taken a journalism course in his life. I had to tell him that it didn’t surprise me. A lot of people think that journalism’s job is to promote things—never critique, never present unflattering facts, et cetera. 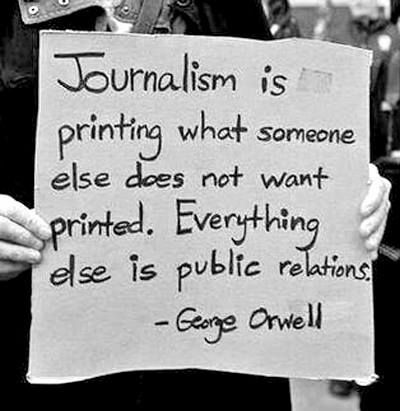 Unfortunately, for the last many years, a lot of those people have been journalists. I used to subscribe to a daily newspaper as well as several news magazines. One reason I cut back was because the piles of partially read publications would accumulate around the house faster than I would read them. But another reason was that it became harder and harder for me to ignore the conservative bias of most publications. They still got accused of being the “lib-ruhl media” by a lot of people, but after I came out of the closet, learned to check my own white male privilege, and became in general more aware of how things worked in the world, I came to realize that society at large had a lot more in common with that conservative Christian campus that I had realized. The Democrats only looked liberal in comparison the the arch conservatives who held a deathgrip on the Republican party. The news media only looked liberal if you accepted that the middle ground, politically, law somewhere between those archconservatives and the Democrats. So I haven’t subscribed to a magazine other than science fiction and fantasy ‘zines for some years. Until now. After watching the incredibly poor job most professional news sites and publications did covering this election, I now subscribe to two publications that consistently did real journalism, asked the hard questions, and ran hard-hitting questions: Teen Vogue and Mother Jones. I’m particularly proud to now be a paid supporter of Teen Vogue, because I’m convinced, now, that if anyone can save us from this authoritarian nightmare, it will be the Millenials and Generation Z. To be fair, since the troompa loompa had his so-called press conference where he shouted about fake news and filled the room with his own staff to applaud his ridiculing of some reporters, much of the rest of journalism has begun to remember that their job is to inform the public, not cater to the whims of people in power in hopes of retaining access. Let’s hope it isn’t too late. Uplifting, Heartbreaking, Enormous Crowds at Women’s Marches Around The World. Women’s Marchers Drove the ‘Trump Unity Bridge’ Out of Town. The Woke Men of the Women’s March Good-Naturedly Answer Our Questions. The Women’s March on Washington in pictures. Here’s What The Women’s March Organizers Want To Happen Next. Crowd Scientists Say Women’s March in Washington Had 3 Times More People Than Trump’s Inauguration. Women’s March, Phoenix, Arizona, January 21 2017. Just A Few Of The LGBT Signs Seen At The Women’s March. Trump’s Inauguration vs. Obama’s: Comparing the Crowds. Sorry Sean Spicer, Trump’s Inauguration Garners 7 Million Fewer Viewers Than Obama’s. Trump And White House Press Secretary Attack Accurate Media Reports On Inauguration Crowds. Trump Melts Down During CIA Speech And Whines About Inaugural Crowd Size.